"Sampath Speaking" - the thoughts of an Insurer from Thiruvallikkeni: Nations of the World .... and the tiniest amongst them !!! Nations of the World .... and the tiniest amongst them !!! Heard of Sealand – is it a Nation, and if so the tiniest one ?? How many countries are there in the world? ~ a good common Q for general Public … yet has different connotations – for Marine Insurer – the list of Nations would be more meaningful on whether your Nation has trade with such a Nation – also whether it should figure in the ‘negative’ or prohibited list – either way – there has to be a list (table or whatever format) of Nations !!!. According to Nationsonline.org – it is 195 – it states that since South Sudan became an independent state on 9 July 2011, there are now 195 independent sovereign states in the world (including disputed but defacto independent Taiwan), plus about 60 dependent areas, and five disputed territories, like Kosovo. Many sources offer different answers, and depending on the source, there are 189, 191, 192, 193, 194, 195 or 196 independent countries in the world today. As of 2008, the United Nations has 192 official members (including Montenegro and Serbia - the two newest nations). That number does not include the Vatican, and it doesn't (yet) include Kosovo ! – most sources would differ on whether to include – Kosovo, Palestine, Greenland, Western Sahara …. And more… The US State Department recognizes 194 independent countries around the world, but that list of countries reflects the political agenda of the United States of America. As an example, it includes Kosovo, but does not include Taiwan, as China claims that Taiwan (the ROC) is simply a province of China. Regarding England, Scotland and Wales, though all are widely considered individual countries, they are all still a part of the United Kingdom (UK), a recognized European country by the United Nations, United States, and others, and therefore included within the United Kingdom. 1. The membership within the United Nations system column divides the states into three categories: 193 member states, two observer states, and 11 other states. 2. The sovereignty dispute column indicates states whose sovereignty is undisputed (190 states) and states whose sovereignty is disputed (16 states). Then there is ISO …. Yes - ISO 3166-1 is part of the ISO 3166 standard published by the International Organization for Standardization (ISO) defines codes for the names of countries, dependent territories, and special areas of geographical interest. It defines three sets of country codes. The alphabetic country codes were first included in ISO 3166 in 1974, and the numeric country codes were first included in 1981. The country codes have been published as ISO 3166-1 since 1997. Now to answer the Q at the start – Sealand - Fort off the English coast has just 22 residents – still has its own king, stamps and currency The Principality of Sealand is a micronation located in the North Sea. Its mass consists of what was HM Fort Roughs, a former Second World War Maunsell Sea Fort, off the coast of Suffolk, England, United Kingdom. While it has been described as the world's smallest country, or the world's smallest nation, Sealand is not recognised by any established sovereign state, although Sealand's government claims it has been de facto recognised by the United Kingdom (after an English court ruled it did not have jurisdiction over Sealand as territorial water limitations were defined at the time) and Germany. Since 1967 the facility has been occupied by family and associates of Paddy Roy Bates, who claim that it is an independent sovereign state. Bates seized it from a group of pirate radio broadcasters in 1967 with the intention of setting up his own station at the site. Bates is no more…. 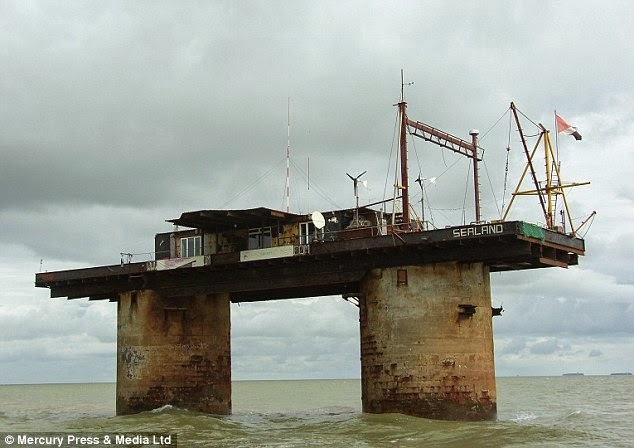 A recent Daily Mail report states that the tiny state consists of two concrete towers connected by an iron platform - originally built as WW2 defence. Lying six miles offshore from Felixstowe, state is 'ruled' by Prince Michael, 63; after his father, Roy Bates, claimed platform as his own and crowned himself king. Its residents catch their own fish and lobster and produce drinkable water; they make money by selling titles (a Count is £200) and Sealand memorabilia. Tourist trips to the 5,290sq ft fort are being planned for later this summer. 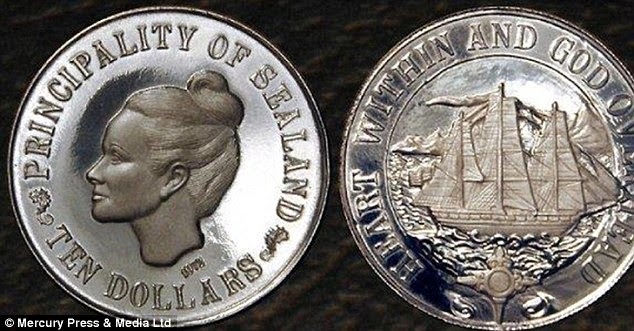 The tiny state occupies a 5,290sq ft Second World War fort has its own currency, the Sealand Dollar, and its own football team, the Sealand All Stars. The Sealand mementoes are sold online. Daily Mail reports you can buy the title Count or Countess of Sealand; alternatively, you can buy one square foot of the territory for £19.99, a mug or a football shirt. As of now, Indian Marine Insurer may not have any problem of insuring a cargo destined for this destination ! ~ longshot may have to take call at some point of time on this port of call !! !